Emerging from the heart of the Tularosa Basin in the northern Chihuahuan Desert in New Mexico, White Sands National Monument is one of the world's great natural wonders. The glistening white wave-like dunes of gypsum sand engulfs 275 square miles of desert, creating the world's largest gypsum dune field and breathtaking landscapes. The White Sands National Monument forms a large part of this unique dune field as a preservation area, which protects the unique flora and fauna that call the dunes home. The White Sands National Monument can be explored on a variety of walking trails which wind through the dramatic landscape of the dunes, including the Dune Life Nature Trail and the raised Interdune Boardwalk, both of which feature interpretive exhibits and information boards on the local wildlife. All trails begin at the White Sands Visitor Center, which has a variety of information about the White Sands National Monument and surrounding region. The White Sands area was inhabited by the Mescalero Apache people who were already living in the field at the time when the dunes were discovered by U.S. Army officers in 1849. The area was first designated as a National Park in 1898 when a group of people proposed the region become a game hunting preserve, which did not come to fruition. 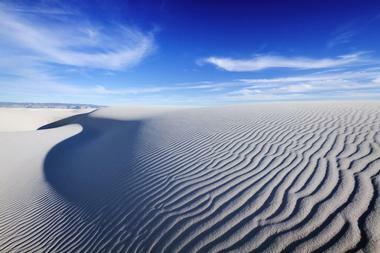 After numerous proposals for the land, President Herbert Hoover created the White Sands National Monument in 1933, after which it was open to the public and still stands today. The White Sands National Monument is located approximately 16 miles southwest of Alamogordo in the counties of Dona Ana and Otero and rests at an elevation of 4,235 feet within the mountain-ringed Tularosa Basin. The southern part of the basin is made up of 275 square miles of pristine white sand made up of gypsum crystals, making it the largest gypsum dune field of its kind in the world. Various forms of sand dunes are found in the White Sands region, ranging from transverse and barchan in the center of the area to parabolic dunes on the northern, southern, and northeastern borders. The Monument is surrounded by military installations, namely the Holloman Air Force Base and White Sands Missile Range and is sometimes closed to the public due to missile testing. The White Sands National Monument is based next to the White Sands Missile Range in the heart of the Tularosa Basin in New Mexico and is open to the public at various times during the season. The Monument is sometimes closed for various periods of time due to missile tests on the White Sands Missile Range next door. Special permits for occasions such as weddings, commercial filming, and photography, and backcountry camping can be applied for. 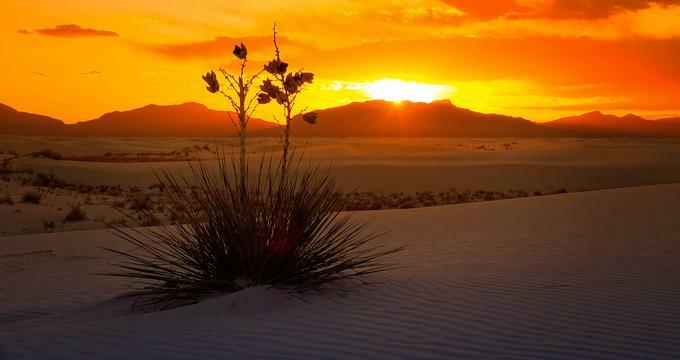 The White Sands National Monument has a ‘Leave No Trace’ ethic whereby the park aims to minimize human impacts on the environment. The White Sands National Monument offers guided field trips for visitors of all ages with fact sheets for young learners and students. Field trips to the Monument can be enjoyed in a variety of ways – as self-guided trips, ranger-guided programs for youth and students, or ranger-guided curriculum-based programs for all ages. The Park also participates in a special Junior Ranger Program, which features a variety of age-group-specific activities.